Thank you for visiting Casa Solution. Casa Solution is the leading real estate company in the Boquete area helping more clients buy property than all of the other agencies combined. We look forward to answering your questions, orienting you to the market and offering you properties that match your specific needs. We are committed to your satisfaction. The best reason to select Casa Solution is our track record and excellent reputation. We have assisted thousands of people successfully purchase property in Panama. Casa Solution is dedicated to providing you with friendly and professional service without pressure. We will work hard to earn your trust. Casa Solution has always been highly protective of clients and will listen carefully to you to ensure the properties you are shown directly match your needs. With a cornerstone of honesty and a unique team approach, the company is a great choice for purchasing property in Panama. More about Casa Solution. Ready to search the Casa Solution site for your perfect property? Casa Solution is grateful to be the recipient of the Best of Boquete award for Best Real Estate Company. This is the second time in a row Casa Solution has won the award and is the sole recipient since the award was first offered. Thank you Boquete! You are the Best! We will continue to do our best to serve you, our great clients, and the community. 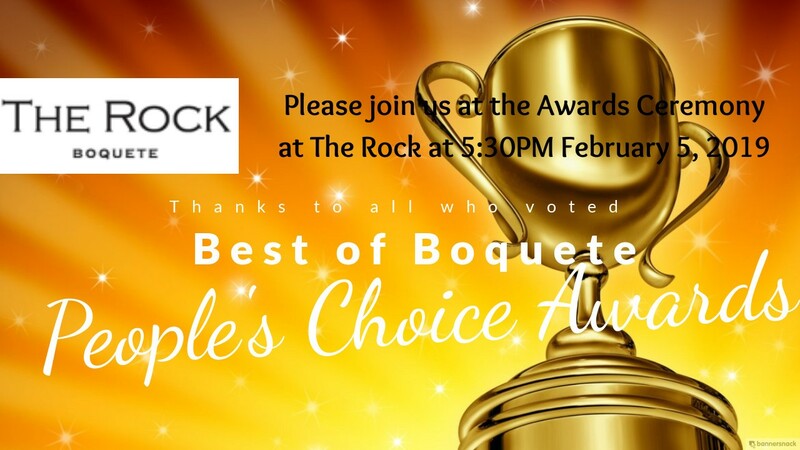 Best of Boquete People’s Choice Awards is produced by Allaboutboquete.com. The process of buying property in Panama is not much different than in other countries, but it is important to know some of the details as well as what to consider in selecting the right professionals to protect your interests. Here are the specifics of the purchase process in Panama. There are two primary options for financing property in Panama – owner financing or a bank mortgage. Most of the transactions with foreigners do not include financing. However, if you have a real estate agent who is familiar with the bank mortgage process it is a good option. Even better if you have an agent familiar with sellers willing to finance themselves as owner financing can be relatively quick and easy. More information on the financing process. Ready to Search for your Panama house or ideal property? Here’s the advanced search feature where you can select from a variety of search options to meet your specific needs. “I would like to give special thanks to Casa Solution for facilitating the purchase of our new home away from home in Boquete, Panama. From the minute that we walked in to the office, we were treated by a very knowledgeable and friendly staff. … All of the transactions were speedily and expertly handled so that by the time we left Boquete, we had a tentative contract and a caring and intelligent lawyer, Mr. Juan Aguilera, who would act as an agent for the purchase of the house in our absence since we had a flight to take back to the United States. When we returned to Boquete, the water and electricity were connected and we obtained the deed of the house. We are very pleased with the condition of the house and the purchase. We look forward to continuing to enjoy our house in Boquete for many years to come. Thank you Damaris for helping us make the final arrangement in our house. Thank you Janeth for the many transactions you personally handled and many thanks to Juan Aguilera, our lawyer, who was recommended by Casa Solution. I recommend Casa Solution to anyone who is interested in buying a home in Boquete, Panama, which is a great place to visit, retire or live.” — Wilsa De Armas and Louis H. De Armas, Jr.